The Alliance Hospitality Residence Inn in Middleburg Heights, Ohio, originally was planned to receive visitors for the 2016 Republican National Convention, which was being held in Cleveland. However, the project was delayed due to settling issues on site. After two years of compression with high fill, the site was ready for construction. The site utilized several small aboveground storage areas, but engineers were unable to achieve all the storm water treatment goals above grade, so some underground storage and treatment was needed. The site had shallow depth, and there were many utility conflicts. In addition, the municipality required a filter system to meet the water quality goals of 80% total suspended solids (TSS) removal, per the New Jersey Department of Environmental Protection (NJDEP). 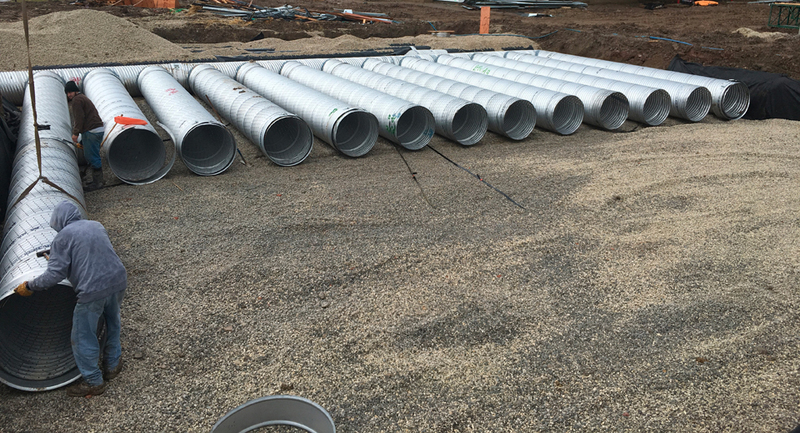 To meet the water quantity goals, engineers selected a corrugated metal pipe (CMP) system made from 2,181 lineal ft of 36-in. perforated aluminized steel Type 2, providing 25,060 cu ft of storage. To meet the water quality goals, engineers selected a Stormwater Management StormFilter utilizing 18 cartridges. The filter was constructed with a removable grate for easy long-term access. The complex layout of the site and the ability to meet local treatment requirements are the two factors that led the engineer to select the Contech solution. The flexibility of the CMP system with varying lengths and the ability to have stubs, elbows, tees and risers incorporated into the system was a key component. The system had to be laid out to avoid utilities such as electric, sanitary and water. The city of Middleburg Heights has unique treatment criteria and was familiar with the StormFilter from previous projects. The ability to treat 80% TSS per NJDEP was paramount in its selection. Contech provided several iterations of drawings as the site evolved and the system layout changed. In addition, a preconstruction meeting was held on site to review the installation process and answer any questions the contractor had. Local Contech personnel also visited the site to check in on the progress and answer questions. Installation was performed by J. Miller & Son in several phases, as the system was spread over multiple portions of the site. The contractor was able to install each part of the system and get it buried before moving on to the next section. The StormFilter was the last part of the system installed. The contractor had the hole prepared and quickly set the vault from the truck directly into place. In the end, the Contech CMP underground detention system and StormFilter allowed for a site to be designed and approved per local regulations. The system was manufactured in a timeframe acceptable to the contractor for installation during the winter. Lastly, the coordination of delivery of the various parts of the system allowed for a successful installation and overall project.